Course contents: cell biology, recombinant DNA technology, molecular biology, genetics, biochemistry, biophysics, instrumentation, bio-analytical techniques, microbiology, immunology, bio-mathematics, bio-statistics, computers, bioinformatics, chemistry, botany and zoology. The field in Biotechnology represents one of the frontiers of science. Biotechnology is a synergy of biological, chemical and physical sciences along with information technology. It draws on the applied life sciences (genetics, microbiology, animal cell culture, molecular biology, biochemistry, embryology, cell biology etc.). It also includes chemical engineering, bioprocess engineering, information technology and nanotechnology. Over the last two decades, world biotechnology has been dominated by the US and Japan. US-based life sciences companies generate a lion’s share of over US$ 500 billion in revenues, followed by Japan. Recently, other markets are looking up as well. India’s biotechnology sector is at a crossroads. On the one hand, it must find affordable solutions to the pressing national needs in agriculture, health and energy, but on the other, it must be competitive enough to take advantage of the lucrative international markets. 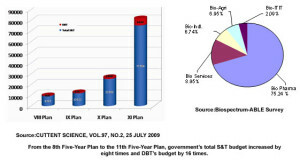 The Indian Government established an independent Department of Biotechnology (DBT) in the Ministry of Science and Technology as early as 1986, much before ‘biotechnology’ became a buzzword. Government funding to the S&T sector increased by eight times from the 8th Five-Year Plan to the 11th Five-Year Plan and support to the life sciences sector steadily increased by 16 times in the same period. As a result, a firmer foundation of life sciences and biotechnology has been created over the years in public-funded institutions, over which a strong edifice of innovation and enterprise could be built now. Fiscal incentives include relaxed price controls for drugs, subsidies on capital limits, and tax holidays for R&D spending. Several State Governments (e.g. Andhra Pradesh, Karnataka, Maharashtra, Himachal Pradesh, Uttar Pradesh, Kerala and Gujarat) have come up with added financial (e.g. tax concessions) and policy incentives (biotech parks, incubators of their own) to spur investment in biotechnology. DBT and other organizations have proactively taken up a number of initiatives in creating trained human resource, institutional infrastructure (e.g. microbial culture collections, cell and tissue lines, gene banks, laboratory animals, facilities for oligonucleotide synthesis, etc.) and a strong research base in the country in areas relating to agriculture and forestry, human health, animal productivity, environmental safety and industrial production. Biotechnology has most emerging career opportunities in India as well as abroad. It has wide variety of career opportunities both in research and industry ranging from sales and marketing, research and development to manufacturing, quality control and quality assurance, teaching, science writing and communication and self employment. Process Development Managers, Process Development Technician, Manufacturing Managers, Manufacturing Technician, Manufacturing Instrumentation / Calibration Technician, Purchasing Managers, Facilities Manager, Toxicologist, Environmental Biotechnologist. Quality Control (QC) Manager/Supervisor, QC Analyst, Quality Assurance Manager/Supervisor, Quality Assurance (QA) Documentation Specialist, Validation Manager. Clinical Research Manager, Biostatistician, Clinical Data Manager/Associate, Manager of Regulatory Affairs, Medical Affairs Director. Business Development Managers, Corporate Planning Managers, Business Development Research Analysts, Product Marketing Managers, Marketing Research Analyst. Director of Project Management, Project Managers, Project Assistants. As journalist and writers for relevant and emerging biological issues. As biotechnology educators encourage to learn new things, in class room, research lab and field. Centre for DNA Fingerprinting and Diagnostics (CDFD), Hyderabad; Institute of Bioresearches and Sustainable Development (IBSD), Imphal, Manipur; Institute of Life Sciences, Bhuvaneswar; National Institute of Immunology, New Delhi; National Centre For Plant Genome Research (NCPGR), JNU, New Delhi; National Brain Research Centre (NBRC), Gurgaon; National Centre for Cell Sciences, Pune. In the public sector undertaking side the leaders are Bharat Immunological & Biologicals Corporation Limited, Bulandshahar and Indian Vaccines Corporation Limited, Gurgaon and so on.. Ample opportunities for self employment in Food Industry, Food Processing, Floriculture, Agriculture, Mushroom Cultivation etc.